Born: Philadelphia, Pennsylvania, 20 September 1924. Education: Studied at the Traphagen School of Fashion, New York, 1942-43. 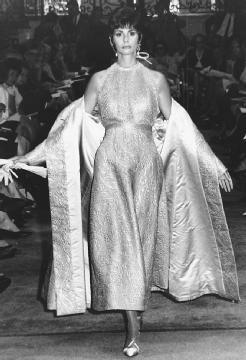 James Galanos, 1964 collection: brocade evening dress with a gold mesh top and matching brocade coat. Career: General assistant, Hattie Carnegie, New York, 1944-45; sketch artist for Jean Louis, Columbia Pictures, Hollywood, 1946-47; apprentice designer, Robert Piguet, Paris, 1947-48; designer, Davidow, New York, 1948-49; designer, Galanos Originals, from 1951; first showing, New York, 1952; licenses include Parfums Galanos, 1980, and Galanos Furs, introduced in 1984; retired, late 1990s. Exhibitions: Galanos Retrospective, 1952-74, Costume Council of the Los Angeles County Museum of Art, 1975; Galanos—25 Years, Fashion Institute of Technology, New York, 1976; Los Angeles County Museum of Art, 1997 (retrospective); Smithsonian Institution; Metropolitan Museum; Brooklyn Museum; Philadelphia Museum; Ohio State University; Dallas Museum of Art. Awards: Coty American Fashion Critics award, 1954, 1956; Neiman Marcus award, Dallas, 1954; Filene's Young Talent Design award, Boston, 1958; Cotton Fashion award, 1958; Coty American Hall of Fame award, 1959; Sunday Times International Fashion award, London, 1965; Council of Fashion Designers of America Lifetime Achievement award, 1985; Stanley award, 1986; inducted, Fashion Walk of Fame, Seventh Avenue, New York, 2001. Address: 2254 South Sepulveda Boulevard, Los Angeles, CA 90064, USA. Waltz, Barbara, and Bernadine Morris, The Fashion Makers, New York, 1978. ——, New York Fashion: The Evolution of American Style, NewYork, 1989. Donovan, Carrie, "Good as Gold Clothes," in the New York Times, 23November 1980. Morrow, Suzanne Stark, "The World of James Galanos," in Architectural Digest, October 1981. Talley, André Leon, "A Certain Quality: Galanos," in Vogue (NewYork), April 1985. Batterberry, Ariane and Michael, "The Loner," in Connoisseur (NewYork), May 1985. Milbank, Caroline Rennolds, "James Galanos: Disciplined Elegance in the Hollywood Hills," in Architectural Digest, September 1988. Morris, Bernadine, "By Galanos, the Simplest of Splendors," in the New York Times, 27 February 1990. "A Galanos…Why is It Worth It?" in Harper's Bazaar, June 1991. Morris, Bernadine, "Galanos Has the Last Word for Fall," in the New York Times, 24 August 1993. Hainey, Bruce, "James Galanos: Art Exhibit," in Artforum, September 1997. Givhan, Robin, "Saluting Fashion's Ageless Wonders," in the Washington Post, 20 July 2001. Dedication to excellence, in craftsmanship and design, was the foundation of James Galanos' career. The quality of workmanship found in his clothing is unsurpassed in America today. It may seem a contradiction that his sophisticated, mature, and elegant clothing was designed and produced in southern California, traditionally the land of sportswear. But Galanos was satisfied to remain where he began his business in 1951, a continent away from New York and the center of the American fashion industry. Galanos knew what he wanted to do early in life and pursued his dream to design school, an internship in Paris, and several design positions with companies in New York. When the opportunity arose for him to open his own company, he created a small collection, which was immediately ordered by Saks Fifth Avenue. From this first collection his clothing has been admired for its particularly high quality, especially considering it was ready-to-wear, not custom-made. His chiffon dresses in particular made his reputation in the early 1950s, with their yards of meticulously hand-rolled edges. Galanos gathered some of the most talented craftspersons available in his workrooms; many were trained in Europe or in the costume studios of Hollywood. If his work is compared to that of anyone else, it is compared to French haute couture. His business was more comparable to a couture house than a ready-to-wear manufacturer; there was an astonishing amount of hand work in each garment and all of his famous beadwork and embroidery is done by his staff. Galanos always chose fabrics and trimmings personally during trips to Europe. He lined dresses with silks that other designers used for dresses themselves; and was always a firm believer in the importance of hidden details, such as exquisite silk linings. These details made a difference in the feel of the clothes on the body and the hang of the fabric, and his clients all over the world were happy to pay for them. Many of the world's most socially prominent women were Galanos customers. In the 1980s, he made national headlines as one of First Lady Nancy Reagan's favorite designers. The fact that Mrs. Reagan wore a 14-year-old Galanos to her first state dinner at the White House attests to the timelessness and durability not only of his workmanship, but more importantly, of his design. This type of occurrence was commonplace among his faithful customers. His silhouette remained narrow with a fluid ease and Galanos continued to refine his shapes until his retirement in the late 1990s. If his design stylings changed in 50 years of business, they became more simple and refined. Not one to be satisfied with past success, Galanos relished the challenge of creating the perfect black dress. But despite his fondness for black in design, he was also known for his brilliant and unusual combinations of darker shades. His masterful handling of chiffon and lace tended toward the softly tailored, staying away from excess fullness of any kind. Galanos was not necessarily synchronized with the rest of the fashion world; if the themes of his collections bore similarities to others from year to year, it was coincidental. Galanos preferred to work somewhat in isolation, both geographically and ideologically. His goal was to make the most elegant clothing possible for a select group of the world's most sophisticated women. The number of women who he considers truly elegant became smaller than it was when his career began, but he certainly succeeded in his goal of providing the clothing they required. Even before his retirement, Galanos designs were collected by his customers like other objects of artistic value, and have been well represented in museum collections around the United States. In the 21st century, James Galanos and his contributions to fashion continue to be revered. He was inducted into Seventh Avenue's Fashion Walk of Fame in New York City in July of 2001. The plaques, embedded in Seventh Avenue, like Hollywood's tribute to the stars, were awarded to Galanos, Donna Karan, Oscar de la Renta, and Pauline Trigére. Bonnie Cashin, Giorgio di Sant'Angelo, Anne Klein, and Charles James were also honored with Seventh Avenue plaques, posthumously.